For all intents and purposes the story of Shrek is a fairytale. There's a princess, a tower and a knight in shining armour. However in this story, the princess has sass and the knight is an ogre with a donkey as a sidekick. When Shrek's swamp is overrun by fairytale creatures he heads to Duloc to find Lord Farquaad, the man responsible for the mess. Shrek makes a deal to rescue Farquaad's one true love (Princess Fiona) in exchange for the deeds to his swamp. Trouble is Fiona is stuck in the highest room of the tallest tower guarded by a fire breathing dragon. The production of this show is one of the most elaborate I have ever seen, the set just incomparable to anything else on tour right now. 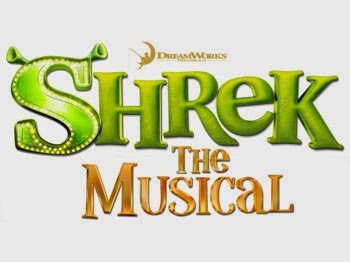 The plot of the musical stays very true to the film and provides the audience with great insight into the well loved characters while the incredible costumes plummet viewers right into the world of Duloc. Dean Chisnall was such a lovable Shrek and really endeared himself to the audience. He seemed very comfortable in the role and just looked like he was having so much fun on stage. Princess Fiona understudy Nikki Bentley proved she could hold her own with very strong vocals and acting to match. Gerard Casey stole the show with his hilarious portrayal of Lord Farquaad, generating laughs from the audience with every move he made. Special shout out to Candace Furbert who voiced the dragon. Her powerful yet soulful version of 'Forever' almost took the roof right off the theatre. Sherk has a pantomime aspect to it prompting audience participation, and in true panto style is suitable for all ages. The comedic script is packed with innuendos for the adults and the colourful, ever-changing set will hold the kids’ attention. The one thing I feel could be better is the score. There are some great songs such as 'I Know It's Today' and 'Who I'll Be' but for the most part I found the rest forgettable, however saving 'I'm a Believer' for the last song was a perfect ending to the show and a real crowd pleaser.